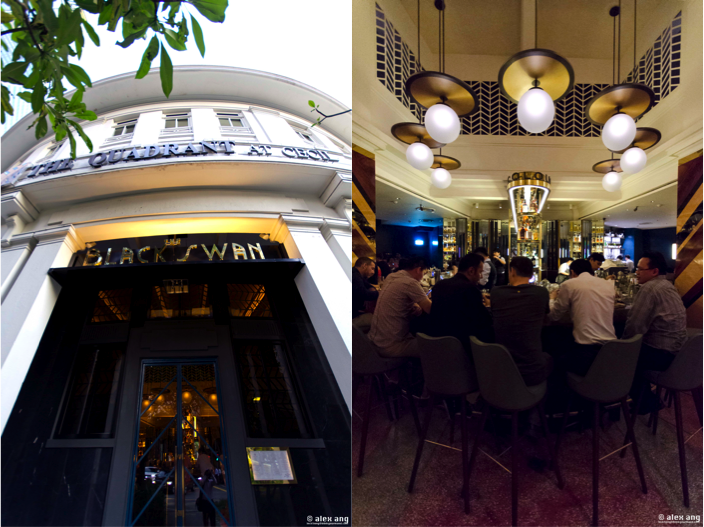 Metaphorically, black swan describes an “unexpected event” in the financial market that is “almost impossible to predict” and what a fitting moniker it is for the surprise debut of an eatery in the heart of the financial district by the Lo & Behold group – The Black Swan. Set in The Quadrant @ Cecil, a 1930s heritage building that once housed the office of Kwangtung Provincial Bank and was, most recently, Cherie Hearts childcare, the folks behind The Black Swan are pulling out all the stops to bring the pomp and glam of after-hours party back into the dreary CBD. Blessed with a soaring ceiling of cathedral proportions and gorgeous floor-to-ceiling windows, the 4,000 square feet space provides rich fodder to bask in the glory of art décor flourishes, and the designers wasted no time in imbuing the dim light space with hanging frosted lamps, luxurious wood paneled walls, elegant brass fittings and a stunning granite-topped U-shaped bar packed to the rafters with the thirsty crowd. The roomy digs seats 130 pax, split equally between the raucous bar wing decked with high chairs on the left and a convivial reservations-only dining wing on the right. Stacked on the upper mezzanine level is The Powder Room – a lounge, really – that packs in an additional 60 pax – you don’t belong here unless you’re out seeking a night of unalloyed revelry. 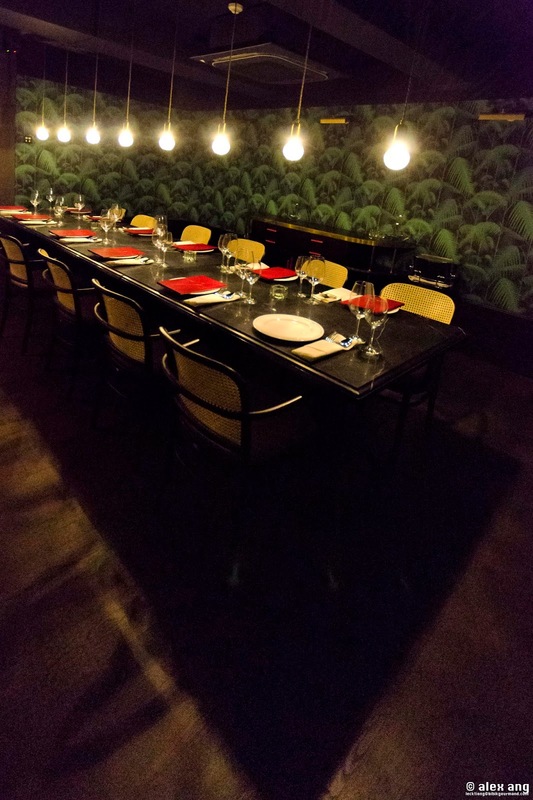 For private events, ask about the cavernous 12-seat bank vault-turned-private room in the basement. Thanks to bar manager, Kamil Foltan, The Black Swan has an exemplary list of whiskies (including Japanese, Taiwanese and Indian whiskies), cocktails and a 70-label strong wine menu – all catered to the post-office drinking crowd. Yes, with a mega drinks list and a gorgeous space of such epic proportions, one sometimes expects the food to fade into subsistence. 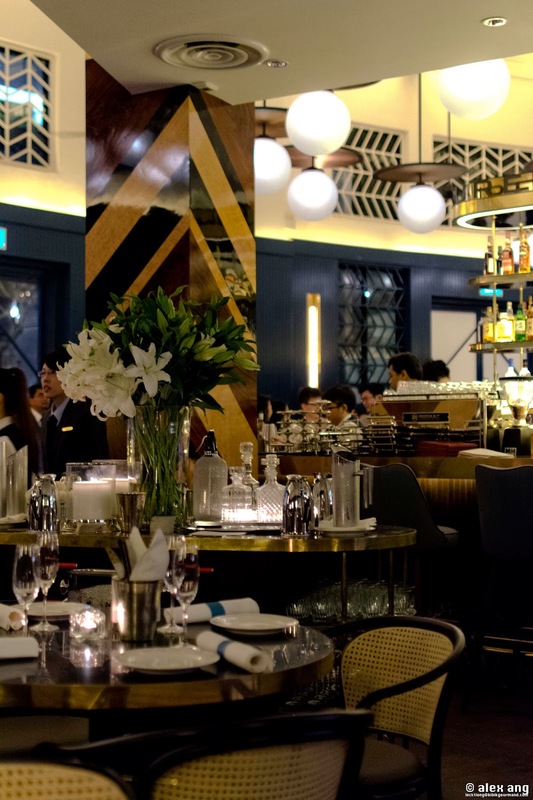 Thankfully, Sebastian Ng of Restaurant Ember comes to the rescue with a one-off consulting stint on the robust French-accented menu of oysters, crostini, small plates and large plates. Though he’s not here to see to the execution, the kitchen seems to be cruising well on autopilot mode. To start, the menu of crostini is perfect to go with a glass of aperitif – we adore the flavourful globs of baked bone marrow tossed with chopped kombu and chilli flakes (S$18) and the crostini crowned with halved cherry tomatoes, jamon iberico, feta cheese and green olives (S$12). If you come during happy hour from Mondays to Fridays, great value awaits via the ‘liquor and oyster happy hour’ deal – S$18 will get you a glass of Champagne to go with a pair of freshly shucked oysters from the Oyster Bar. The small plates menu holds not-too-many surprises, just some classics with a few twists but all well executed. 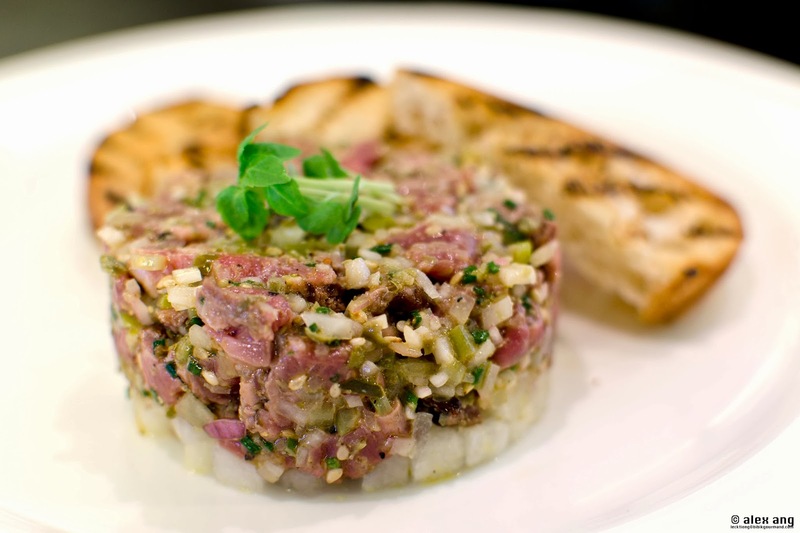 Beef tartare (S$26) catches our attention for the unusual use of partially chargrilled – rather than raw – 365 days grain fed beef. The beef is first hand-chopped and tossed with toasted black sesame seeds then served on a mound of cubed nashi pear with toasts on the side. Chilled gazpcho (S$18) does not raise any eyebrow too, just good clean flavours from blended grilled capcisum with a block of roma tomato sorbet and cubes of celery and cucumber. 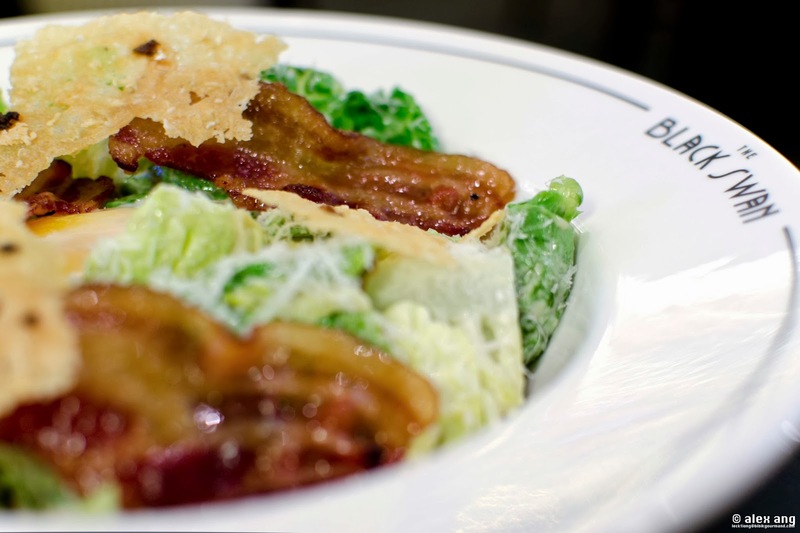 The same goes for the new caesar salad (S$18) that arrives totally undressed save for the perfectly runny one hour-poached egg with Parmesan-anchovy crisps and bacon strips. Large plates keep the momentum going in the pleasant territory. The plate of grilled seabass (S$36), while not the most sustainable seafood option, is a crowd pleaser. 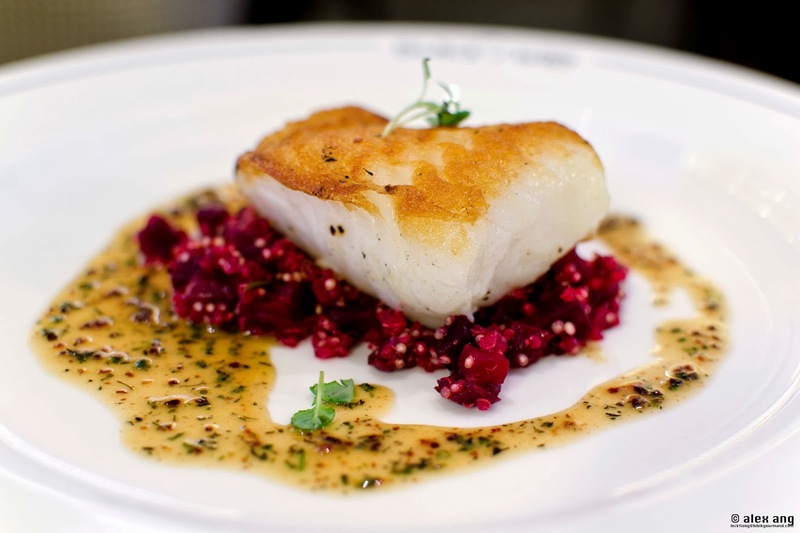 The pristine hunk of just-cooked fish arrives on a blanket of roasted-chopped beetroot tossed with quinoa alongside a drizzle of delicious bacon veloute. 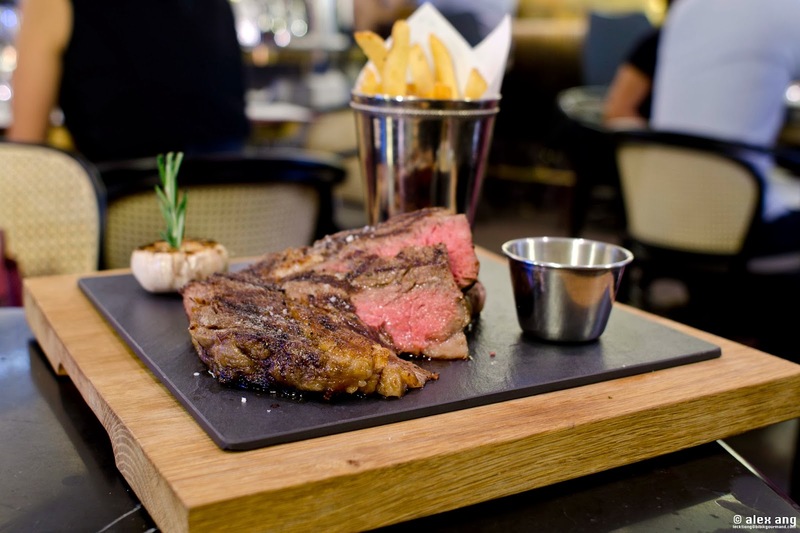 If you’re feeling carnivorous, the Stockyard Australian 400 days grain fed ribeye steak (for 2 persons, S$96) beckons with about half a kg of succulently marbled meats skirted by roasted garlic, fries and a dish of béarnaise sauce. Both are excellent. 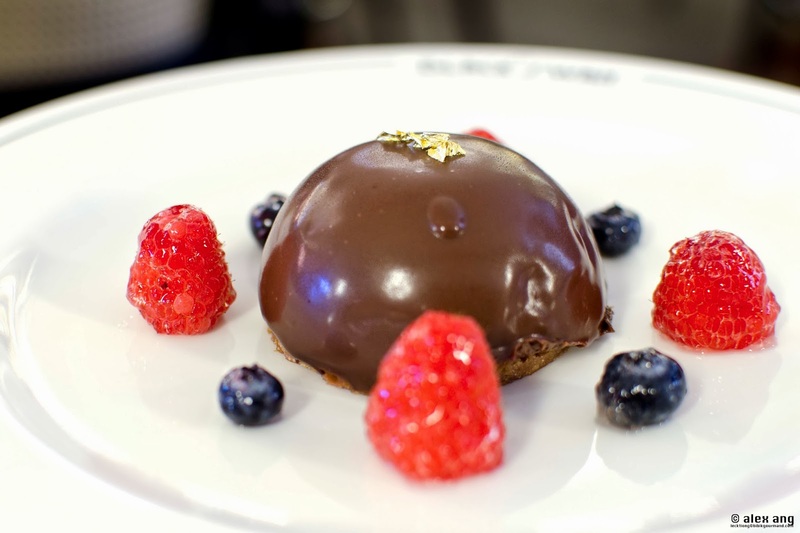 Those with a sweet tooth may be underwhelmed by the limited choices of just 3 items on the desserts menu; but judging by the sweet of dark chocolate dome (70% Valrhona chocolate) with vanilla crème with oh-so-crisp praline, quality counts, not quantity. But truth be told that we’re less impressed with the coconut crème caramel with gula Melaka. If you have not visited The Black Swan, try to resist judging it as a superfluously beautiful party venue that’s weak on substance. Yes, the space is dazzling but our dinner shows the food to be resolutely accomplished. That’s another feather in the cap for this newly minted party capital of the CBD!